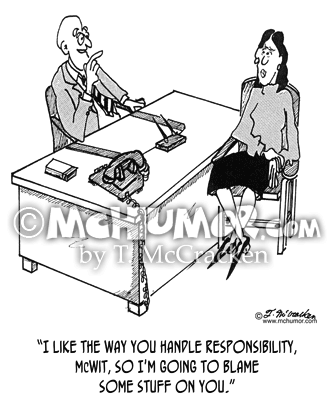 Employee Cartoon 1927: A supervisor says to an employee, "I like the way you handle responsibility, McWit, so I'm going to blame some stuff on you." 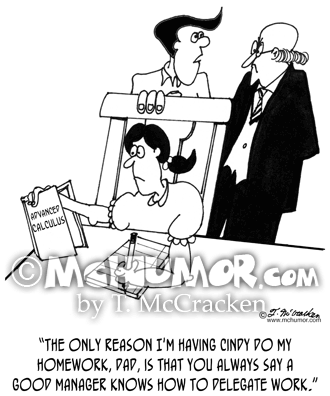 Executive Cartoon 3976: Of a girl writing at his desk, a boy says to his father, "The only reason I'm having Cindy do my homework, Dad, is that you always say a good manager knows how to delegate work." 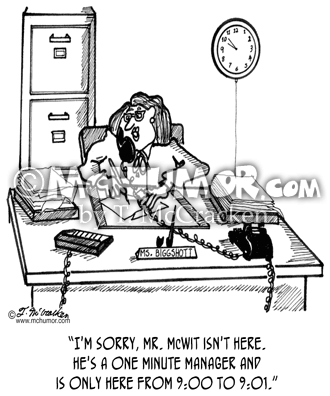 Executive Cartoon 2003: A secretary on the phone saying, "I'm sorry, Mr. McWit isn't here. 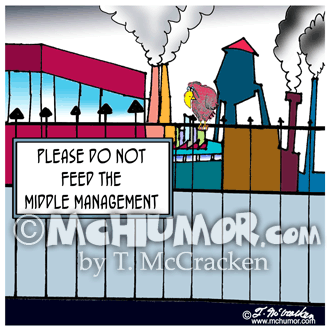 He's a one minute manager and is only here from 9:00 to 9:01." 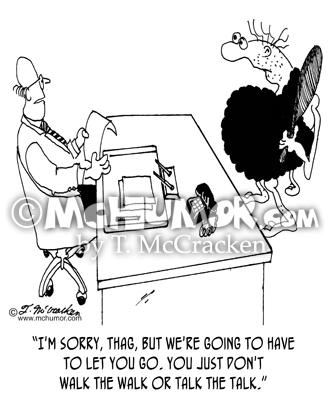 Employment Cartoon 7207: An executive says to a caveman whose knuckles are dragging on the floor says, "I'm sorry, Thag, but we're going to have to let you go. 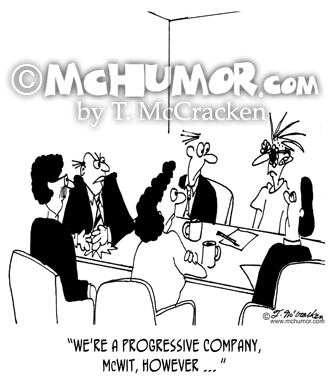 You just don't walk the walk or talk the talk." 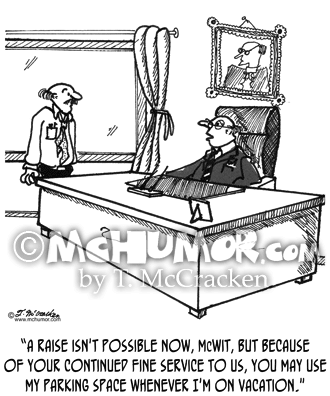 Employee Cartoon 1922: A supervisor says to an employee, "A raise isn't possible now, McWit, but because of your continued fine service to us, you may use my parking space whenever I'm on vacation." 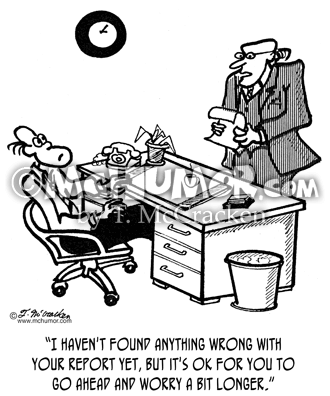 Fashion Cartoon 6440: A stuffy chairman saying to a man dressed as a punk at a board meeting, "We're a progressive company, McWit, however ... "
Office Cartoon 2897: A supervisor says to an employee, "I haven't found anything wrong with your report yet, but it's OK for you to go ahead and worry a bit longer." 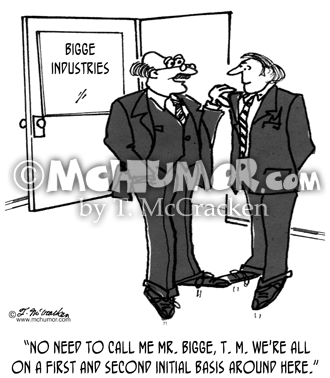 Executive Cartoon 1921: A supervisor saying to an employee, "No need to call me Mr. Bigge, T. M. We're all on a first and second initial basis around here."